These Fab Shops went live late January, allowing Fab.com members to visually browse through products via dedicated online storefronts that were organized around product categories, as opposed to by designers. That way, if you wanted to shop only for jewelry or furniture, for example, you could simply drill down into those items using the new Fab Shops option. Shops could also be sorted by both popularity and price, when they launched on the web. With today’s mobile and tablet app updates, the shops section is split into “pop-up shops” and “more shops,” and a sort button lets you rank them by price, by bestselling, most favorited, or by “random” (the default). There are now over 20 shops to choose from. Also new is an updated browse menu that lets you find products by shop, price, or, in an Etsy-like fashion, by color, also featured which launched first on the web. 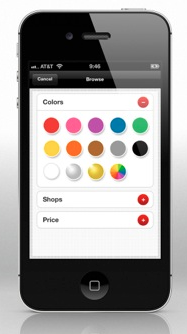 Since the arrival of Fab.com’s mobile apps in October, the number of sales from mobile have been increasing. Today, iPad users purchase at 4 times the rate of web users and iPhone users purchase at 2 times the rate of web users. iPad orders are also significantly larger (by basket size) than web orders, the company reports. Fab says that mobile accounts for a quarter of all of its orders, so it makes sense that it would continue to evolve the mobile experience to match up to that of the web. Given these statistics, however, it may even be prudent to design mobile-first for the next round of updates. The new apps are in the iTunes App Store now, so check for updates. Fab is hinting at a new “iPad-specific” app in the works that’s coming soon, but nothing more on what that will involve just yet.